To provide a forum for discussion and education of interpreting and transliterating issues which involve people who are Deaf or Hearing and of color. 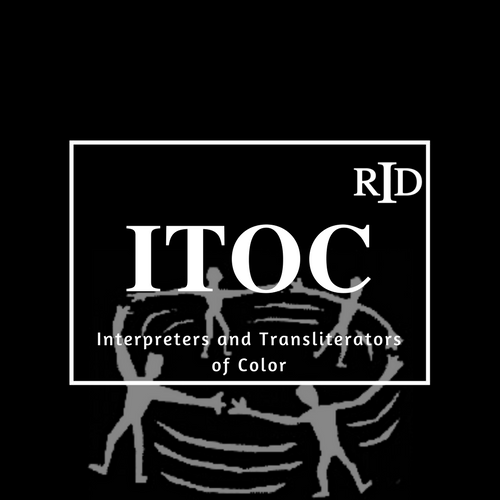 To promote, recruit and encourage active participation of all interpreters/transliterators and consumers of color in ITOC and RID and its Affiliate Chapters. To support all interpreters/transliterators of color who seek RID, Inc. certification. To prepare and/or review materials about interpreting/transliterating among people of color. To act as an advisory resource to the RID, Inc. Board of Directors and to standing and ad hoc committees of RID, Inc. on issues of interpreting/transliterating among people of color. To consult with ITPs seeking to recruit students of color. To actively seek input from consumers of color, particularly, from people who are Deaf/Hard of Hearing and of color on issues of interpreting/transliterating in their communities.